This hotel is 100pct non-smoking. The Hampton Inn Olathe hotel in Kansas was distinctively designed to outfit the needs of today*s traveler. We are pleased to offer our guests the amenities of both home and office while away on the road. Our 24-hour business center offers guests complimentary copy fax and computer processing equipment. Plus each guestroom is equipped with a coffee maker with coffee refreshed daily hair dryer iron with board and complimentary wireless high-speed internet access. We suggest you sit down and enjoy our On the House hot buffet breakfast served daily from 6 to10am. However if you do not get the chance pass by our front desk and grab our On the Run Breakfast Bag filled with high-energy protein snacks and a bottle of water available at 5am. Other features of the Olathe Hampton Inn include an indoor pool whirlpool and exercise room. Whether traveling to Kansas on business or pleasure our Hampton Inn Olathe hotel guests are delighted when they step into our well-designed guest room with an oversized work desk with halogen lighting and an ergonomic swivel chair. Most of our standard king bedrooms come equipped with a mini fridge and microwave. 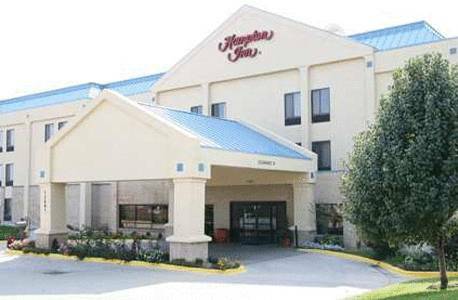 The Hampton Inn in Olathe offers two comfortable meeting rooms at very competitive rates. We excel in accommodating the exclusive needs of each guest whether it*s for a small business meeting or a mid-size meeting serving up to 60 guests. We look forward to welcoming you and we are committed to make your stay as effortless as possible. We love having you here in Kansas at the Hampton Inn Olathe hotel. Ruby Tuesday: American best casual dining restaurant. Joe*s Crabshack: Enjoy eating fresh crabs in a tacky looking shack filled with the feel of a Gulf Coast fishing camp. TGI Friday*s: Bakery with sweets and freshly made sandwiches and soup. Very tasty. Thai Place: Thai Cuisine Extremely Good.